3 Bottles of Brain Octane Oil – 473 ml / 16 oz. 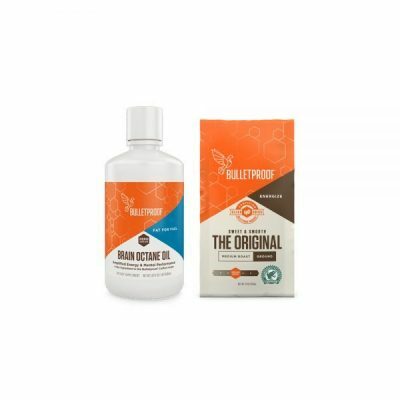 Every since I started using this product in combination with my ketogenic lifestyle, I have noticed significant positive changes in my mental clarity. I also have experienced less brain fog and have been able to maintain my “fasted” state for much longer and get the therapeutic benefits desired. Thank you for all you do Dave! I really appreciate it. It has helped me out immensely. Enjoying the great flavor and amazing energy I get from my daily bulletproof morning coffee! The coffee kit with brain octane is a great buy! Starting the day with Bulletproof coffee has given me much more energy without the jittery feeling of my old coffee. I was drinking 3 large cups of regular coffee, now one is totally enough. I feel more alert and clear. This is a must for a non-morning person. Before, I needed coffee. Now I LOVE coffee!!!! The coffee and brain octane really have helped to reduce my brain fog! I do not allow myself to run out! Love the podcasts, the book, and learning how to be healthier. I really feel empowered because since I’ve changed how I eat, food cravings no longer have control of me and making healthier/smarter food choices is soooo much easier! AWE…WHAT A WAY TO START THE DAY OFF RIGHT!!! 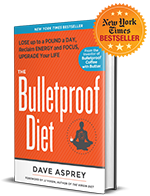 I have been drinking bulletproof coffee for about one year now. It is honestly the best coffee I have ever had the pleasure to drink. My morning routine wouldn’t be complete without my coffee. I get the whole beans. Grind it myself…I use 4oz. of beans in my grinder. Takes all of 12 seconds to grind. Boil my water (filtered water or SmartWater) using one quart of water. After boiling, I pour water slowly over the grounds in a one cup drip filter with a brown #4 filter placed inside the permanent filter. I have a 22oz cup. I start transfering the coffee from my travel mug which holds the filter perfectly…Now pour in grass fed heavy cream…little more whisking and let the SIPPING begin…AWESOME. AMAZING RESULTS AFTER THE FIRST CUP! I just had my first cup of bulletproof coffee. Afterwards I walked the dog for 2 miles, cleaned the entire second floor (I’m a dude so this is a big accomplishment), and I am still going strong. No food cravings, no jitters, no brain fog, just smooth easy energy. I can’t wait to see how I feel after 2 weeks on the Bulletproof diet. start everyday with Bulletproof coffee and Brain Octane Oil plus Collagen protein and couldn’t be happier. Nothing is worth more than my health!